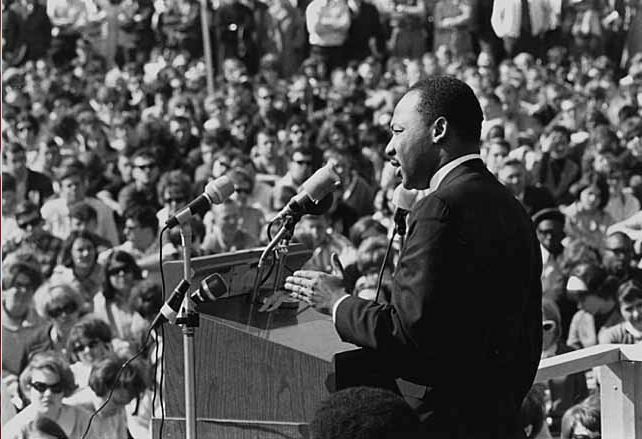 Martin Luther King speaks to an anti-Vietnam war rally at the University of Minnesota, St. Paul on April 27, 1967. Photo from Wikimedia Commons. A mural depicting 24 influential African American leaders will be dedicated at UC San Diego Wednesday. The work on the first floor of the Price Center depicts luminaries like singer/actress Billie Holiday, poet Maya Angelou, Supreme Court Justice Thurgood Marshall and the Tuskegee Airmen, the highly decorated black fighter pilots of World War II. The dedication is one of numerous events on campus celebrating Black History Month. The events lead up to the 13th Black History Month Scholarship Brunch Feb. 28. The primary speaker is scheduled to be “Breaking Bad” actor Giancarlo Esposito, who is set to play Frederick Douglass in a film about abolitionist John Brown.